It’s very exciting to know that the night sky is full of galaxies, nebulae and star clusters to observe and photograph. The great Andromeda Galaxy, the glimmering Pleiades, and the vibrant red California Nebula are all jaw-dropping astrophotography subjects. But what is the best way to capture these amazing deep-sky objects? 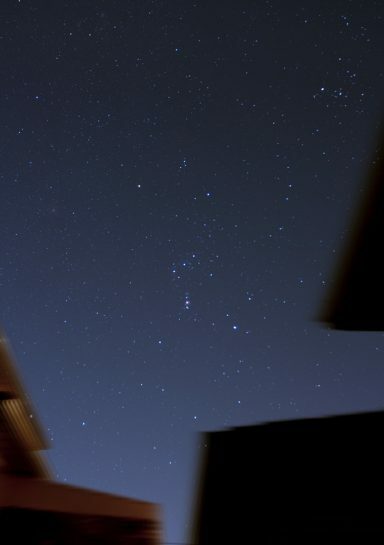 The followers of this blog know that I am all about astrophotography with a DSLR and telescope. 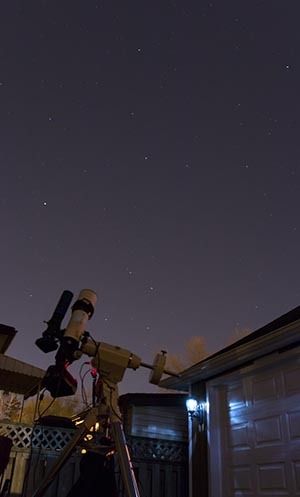 This is a popular deep-sky imaging setup and is capable of some incredible results using affordable equipment that can often be purchased used. A DSLR camera is a perfect option for beginners as they are much more user-friendly than a dedicated CCD astronomy camera. 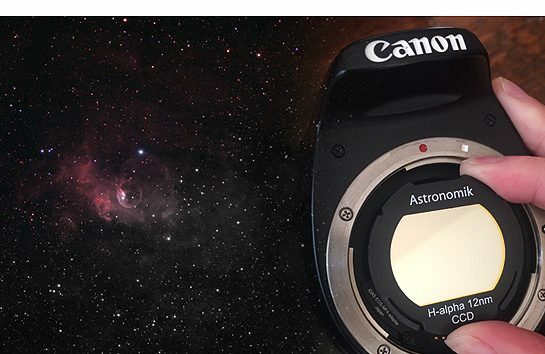 In the post below, I’ll give you the ultimate astrophotography target for your DSLR and telescope. I use a Canon 600D DSLR and an Explore Scientific ED102 CF telescope. View my complete setup. As we approach the end of 2016, I would like to thank everyone who has connected with AstroBackyard this year. Whether it was a YouTube comment, retweet, or Facebook like, I really appreciate the support. I’ve connected with beginners, seasoned veterans, and everyone in between this year. 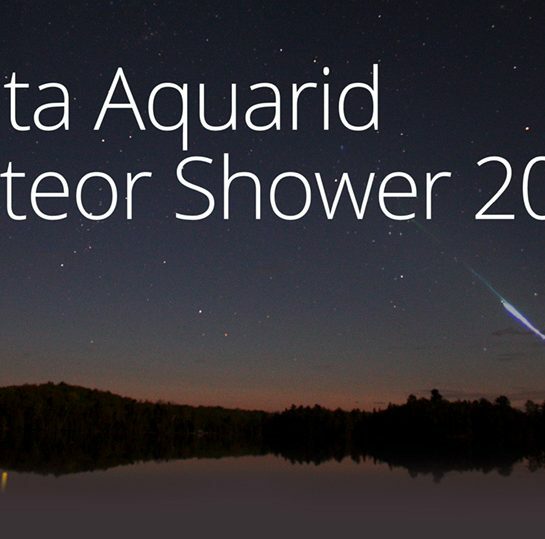 I hope you were able to get outside and partake in some astrophotography with your DSLR and telescope this year. As you learn more about astrophotography, it’s almost certain that you will want to revisit previous imaging projects. The lessons learned during each and every night out with your DSLR and telescope make you a more efficient and organized astrophotographer. As a beginner, my goal was to photograph as many galaxies and nebulae as possible. Equipped with more tools and knowledge, I am now taking a second look at some of best deep-sky objects the Universe has to offer. As for my latest astrophotography project, I’ve moved on from my Horsehead nebula photo for the year. Not that it couldn’t benefit from more time and processing, it’s just that I shared the photo so much that I thought it would be best to shelve the project for now and complete it next winter. This project helped me hone my skills of combining narrowband data with color images, as seen in my latest video tutorial. I have now started pointing my telescope towards the alluring diffuse nebula known as Messier 42. The glowing Orion Nebula is in prime position for imaging over the next month or two. 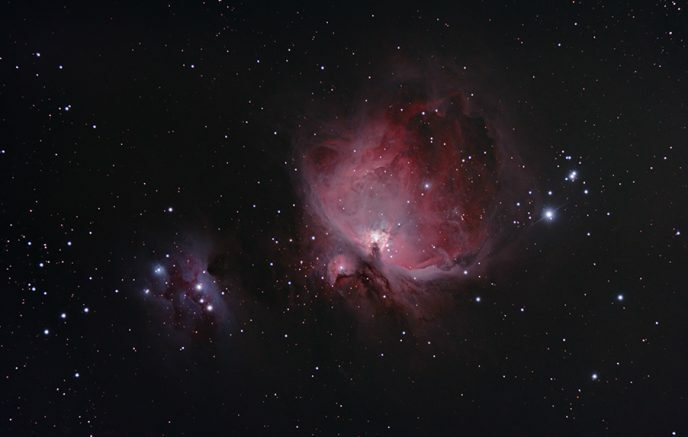 I have photographed M42 many times over the years, but since then I have made many advancements I made in terms of both equipment and technique. With my telescope’s relatively wide focal length (714mm), I can include the Running man nebula (NGC 1973, NGC 1975 and NGC 1977) in the same frame. I added a modest amount of data using my old DSLR and telescope (Canon Xsi and ED80) to an earlier version of Orion last year, but not nearly enough to do it justice. My previous version of the Orion nebula was shot with an 80mm telescope (Explore Scientific ED80) and a Canon Rebel Xsi (stock). The image I produced consisted of RGB data only (No H-Alpha), and was lacking the rich color that astro-modified DSLR cameras can produce. On Thursday, December 22nd, I began my latest astrophotography project with my DSLR and telescope. I have a new favorite spot in the backyard that offers the widest possible window to the sky when aiming at M42. Stellarium was helpful in planning this position for this particular time of year. From my location, clear nights are few and far between in the winter months. Obtaining enough data (5 hours+) to process the image to its full potential will be a challenge. The final image will likely have much more Ha data than RGB. The nights leading up to, and during the full moon are more commonly clear. New to using a DSLR and telescope? Try Orion! 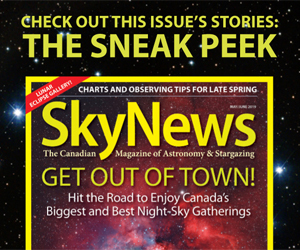 Beginners are drawn towards the Orion nebula as an astrophotography target, and for good reason. The bright color and intense details of this object can be captured even in very short exposures. When shooting with a DSLR and telescope for the first time, focus and proper tracking are some of the biggest hurdles to overcome. 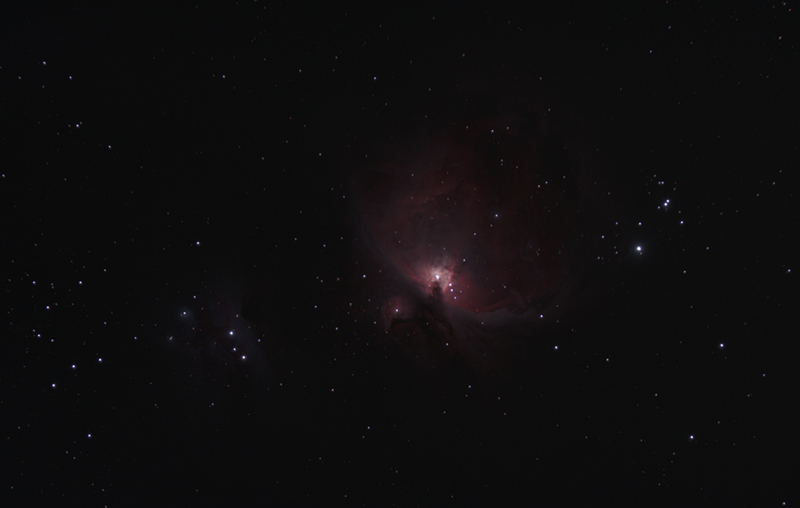 Fortunately, M42 is very forgiving in terms of both focus and tracking. The bright stars that populate the area in and around the Orion nebula are perfect for adjusting focus and framing. Many deep-sky objects are very dim, with no bright stars within the same field of view. This can make focusing and framing the target a nightmare. I like to use the stars in the Trapezium to achieve the best possible focus while using my Cameras live-view mode, or on BackyardEOS. 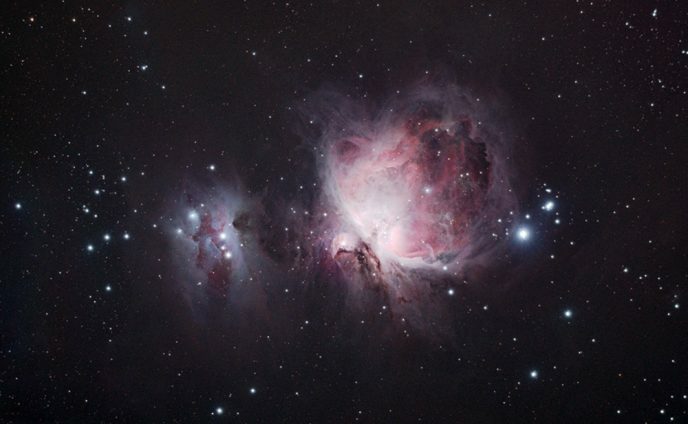 The stars in the Sword of Orion are a great help when it comes to aligning your image. Even better than that is the fact that the overall size and shape of the nebula is revealed in short exposures (5 seconds). This makes capturing test frames and making adjustments much easier. This is not the case when shooting a faint reflection nebula such as the Witch Head nebula! Beginners usually need time to fully utilize their telescope mount’s tracking and autoguiding abilities. The longer the exposures, the more evident poor tracking becomes. Luckily for beginners, an impressive photograph of M42 is possible using multiple exposures of 1 minute or less! This target is just begging you to capture it! The bright core of the Orion Nebula requires very short exposures to properly document the area. To capture the Trapezium without over-exposing the image, I shot several 5-second subs at ISO 800. I also set BackyardEOS to shoot a series of 30-second subs to capture the mid-tones and slightly less-bright areas surrounding the core. Here are the totals from each series of shots at lengths of 5, 30, and 180 seconds at ISO 800. I registered and stacked each of the image sets in Deep Sky Stacker, and processed each of the files separately. Once each image file was processed to maximize the intended level of detail, I blended the images together in Adobe Photoshop using layer masks. This can be a difficult process, as this can sometimes lead to unnatural looking and/or flat looking deep-sky objects. Using layer-masking in Adobe Photoshop, we can merge the data from all 3 image sets to reveal all of the details of the Orion Nebula in a single image. As I said earlier, this process can be difficult to master and takes time and patience to utilize properly. If done properly, the nebula will look natural and full of detail. I’ll provide updates along the way as I tackle this winter astrophotography project from the backyard. Despite what the frigid winter temperatures do to our bodies, your DSLR will produce images with less noise in the cold! The nights are also extra long, which means the potential of longer imaging sessions. So fill your thermos will a hot drink, it’s going to be a long night. If you need me, I’ll be in the backyard. Cheers, and all the best in 2017! I have only been following you site for a couple of months. You images are very nice and the explanations you give of the imaging and processing are easy to understand. I know this site and the videos you make take a lot of your time, but please continue if you can. You are helping more people than you might think. Hope you have many clear nights and a happy New Year. I cant agree more with Terry. Compared with other sites, blog or discussion forum, yours is the most enjoyable to read. Best of all, I learn something everytime I visit. As someone just starting out I also appreciate all time and effort you have put into sharing your projects with us through your videos and this website. Please keep it going!!! Thank you for all hep!!!! I have not experienced a passion for photography since I had to close down my darkroom in 2011. I chaned to digital in 2013 and began photogtaphing birds. But there was no “wow!” factor anymore as when an image begins to form in the developer. My “wow!” factor is back and I owe it to you….I’m 54 and astrophotography has me fascinated with the objects overhead that I know I have the ability to capture. The photography side of this pursuit is not as difficult but I am struggling with the post-processing side so far. 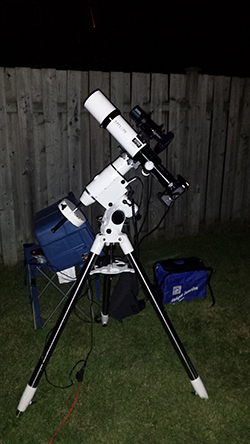 I have now the Orion Sirius mount and am imaging with a Canon 60D + 300mm f4 L + 1.4x extender (scope to come later). Just wanted you to know that….so now my question. After you have processed each image stack (5, 30, 300 sec) to the desired detail and after you have combined them in PS for one composited image……..is there any further processing of the composited image….more levels and curves etc…..? Congratulation for your page and youtube channel.I have a question.